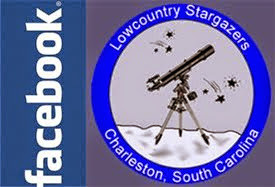 The Lowcountry Stargazers will hold their next meeting on Thursday, April 4th at 7pm, at Atlantic Aviation, 6060 S Aviation Ave, North Charleston, SC 29406. This may be a better representation of our meeting location. We will have a presentation on astronomy basics, as well as one on telescope adapters for photography. We'll also talk about upcoming events, including Saturday's event at our dark sky site.